First off, thank you for taking the time to shop our online bite suit store! I hope that you’re finding the ordering process to be easy and simple. When creating this site my main goal was to offer decoys, helpers, trainers, k9 units, etc an EASY, FAST, & EFFECTIVE way to order a bite suit. Everywhere you go the process is complicated, burdensome and includes physical paperwork…. We’re in the era of technology and want to use it! We are the first company to offer a custom bite suit ordering platform that is 100% online. From start to finish, you can order a new bite suit in under 10 minutes, this even includes time to custom design your own unique suit. Long gone are the days of order packets and snail mailing your order to be processed. Your order is sent to us for review and once we have confirmed all information we send it straight to Demanet, making your life easier, with a guarantee of maximum efficiency! Our online process is catered to giving our customers peace of mind, while ensuring the fastest results. We know that Demanet offers the ONLY solution when it comes to a high quality, durable and professionally made bite suit. Invest in a Demanet bite suit and take pride in having a reliable suit, made just for you, that will never let you down. We maintain a great working relationship with our international friends, and are proud to bring you their best suits through our online store at the lowest pricing available. DemanetBiteSuits.com is operated by Complete Canine Training LLC. We are based out of Loveland, Colorado and our team has been training police K9s, protection dogs, and family dogs for over 10 years. We share the same passions as our customers, so we know what you want in a bite suit and we are here to help guide you through the process. Please contact us with any questions and we’ll be happy to point you in the right direction. We look forward to working with you and hope to see you out training dogs across the country, or at an event sometime! Chris has been training dogs since he was 12 years old. He later became an Army veteran where he served as an infantryman, before moving to the scout/sniper unit. He found his passion for training protection dogs in 2013. He took this passion and ran with it, he created his first company, Complete Canine Training in 2015. He runs a training program focused on protection dogs and obedience. 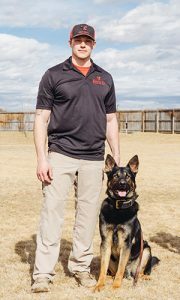 He has since developed his second main focus which focuses on police and military K9 applications and selling high quality working dog gear. Chris started this website because of the high prices other vendors charge for Demanet bite suits. He knows from experience that $1600-$1800 for a bite suit is way out of the price range for most new trainers. His dream is to help the industry of his passion grow by providing the best quality suits at the best possible prices, while making it easy and fast to order. Chelsea and her little pitbull Sammy handle reviewing orders and keeping Chris sane with his ridiculous schedule. Her love for dogs and desire to prove that pitbulls are not the breed everyone makes them out to be, has been the main motivation for her. She is an excellent multi-tasker and makes the paperwork and operations of Demanet Bite Suits, go smoothly and quickly. Her direct communication with Demanet allows us to operate as efficiently as possible. Also if you get her on the phone, you’ll quickly realize that we have the best customer service in the industry!